At North Wind Stables we truly believe the horse should come first. We pride ourselves in taking an individualized approach to each horse in our care. We recognize that each horse can perform optimally only if its individual personality and talents are assessed and understood. We do not believe in the “one-size-fits-all” approach to training. We use medications only as necessary for the health of the horse, and never as a “training aid”. We work closely with our veterinarian to ensure that each horse has any supplements it may need for optimal health and performance. In keeping with our philosophy of happy horse = happy owner, we put the care and comfort of the animals as top priority. We believe that the stall is the horse’s home, and as such, should be a place where he can be at ease and relaxed. We think that consistency and predictability is crucial to ensuring the horse’s comfort and ultimately, his trainability, so we take care to feed at exactly the same times each day and include a noon meal as well as morning and evening feedings. Water is monitored and refreshed throughout the day. Our competent and compassionate caretakers live on-site, as does our training staff. In as much as the stall is the horse’s sanctuary, the ring is his “place of work”. When the horse comes out of his stall, he knows it is time to get down to business. The horses will receive individualized training and exercise six days of the week. Monday is their day off. An integral part of training any one horse is training his partner, as well. At North Wind, we are proud to have a reputation for successfully matching horses with riders, not only to achieve a winning “picture”, but more importantly, to couple riders with horses appropriate to their skill level. We are constantly striving to bring teams to their ultimate potential. With a horse in training at North Wind, you may expect an average of two lesson rides per week on your horse. For an additional monthly fee, you may make use of any practice horse that is available and suited to your riding capabilities. Likewise, our training customers also have full access to practice rides on an assortment of horses in the Saddlebred Rescue ranks at no extra charge. "It was an enourmous decision to return to riding after nearly a 40 year layoff at age 60 with several nagging physical issues. North Wind was the only barn to welcome me and make me feel comfortable to begin saddleseat riding lessons. Whether it was staff or clients, everyone was supportive of my quest and the journey is ongoing. North Wind has given me the confidence to attempt things that I never thought were possible any longer in my life. At 65, I am looking forward to my show debut this season with the horse of my dreams who has been trained by North Wind's professionals." K.K. "If there are any adults thinking about getting back in the saddle again, this is a wonderful opportunity. I had a wonderful time in my three years of riding and showing at North Wind. 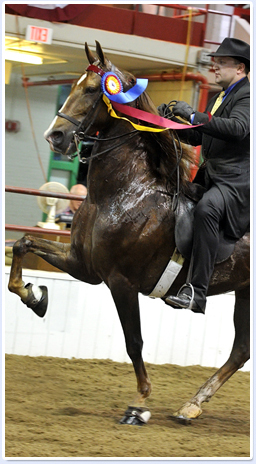 You do not have to be a youngster and saddleseat is easier on your back than hunt seat." M.C. "My daughter has "ALWAYS" loved horses. It is just one of those unexplainable things. On weekends we would try a different stable or equestrian center searching for the perfect riding program that fit us. We didn't know exactly what we were searching for ....until one weekend we visited North Wind Stables and our journey ended. We became part of a "barn family" and it didn't matter what are ages were or what our riding skills were at the time. Over time we have found that we like associating with this great group of people, learning from the best trainers that teach all around horsemanship and my daughter and I are both happier for it." L.G. "I sent my horse to North Wind Stables for a "30 day tune-up". That was on February 16, 2005, nine years ago! In the past 40 years I've had horses in about eight different training barns and I put NWS right up there with the very best of them. Nealia is an exceptional trainer and cares deeply for the horses in her care. I'm so glad she located her business in New Jersey. It's worth the 40 mile drive to the barn to be riding under her watchful eye!" J.B.
"After an extensive search of barns in the area, just one lesson at North Wind convinced us that we are at the right place. Nealia cultivates in her riders not only skills for the show ring, but also compassion. For each ride on a show horse there is a just as rewarding one on one of the rescue horses. Each presents its own unique challenges that make for a much better rider in the future. We learn horsemanship at North Wind." E.G. "I have all my ten horses in training at North Wind. Not only do the trainers here meet my expectations, but they care a lot about the health and condition of each horse. Nealia clearly loves horses but that includes my group and that is important to me. I would not have it any other way." D.G.M.